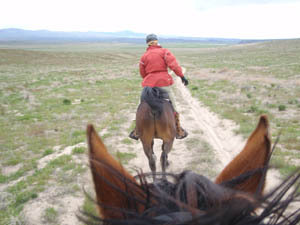 Another fun Owyhee ride on my amazing (to me) horse, with Merri and Jose as the perfect riding partners. Another early morning saddling up here at home, and driving to basecamp in time for vetting in and setting out across the desert. Owyhee Spring (sort of) is a new ride this year. 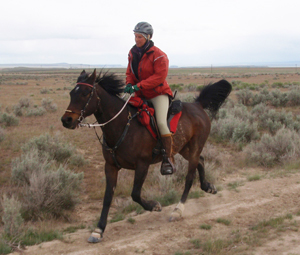 Regina Rose has taken on four Owyhee rides for this season - the (used to be here) Tough Sucker, the Owhee Spring (sort of) and the 2-day Owyhee Halloween. I am soooooo glad she's doing this since I can now go and ride instead of manage. I'm sticking with managing the multiday rides which I really love doing most of all. So another chance to ride the trails that I'm usually watching other people ride! Regina found some new trails over and around Murphy Butte, and put together a really fine course. The footing was perfect! Some rocky sections along the river and coming down off of the butte, but otherwise firm dirt roads and cow trails for mile after mile. And bountiful grass every step of the way for quick bites when the pace slowed down. Merri and Jose (and the Raven) are really the perfect riding partners. Rhett and Jose are buddies, they are very well paced, both very comfortable at a 10mph trot, both can lead without upsetting the other, they have a little competition between them which keeps them both engaged. Merri is always taking photos so I'll be able to look back at the ride and remember the trail. The Raven is a silent riding partner, but we all know he's there. We joined up with Richard White and his new awesome horse Kryptoknight as we came up out of the river and the three of us rode together the rest of the ride. I had another one of those amazing rides on my amazing (to me) horse Jaziret. Strong, steady, willing, bold... just pure pleasure. I had planned on gluing boots on him for this ride, having had a less than perfect experience with him in the Gloves at the last ride. But I ran out of time, the weather was crappy, and I reluctantly settled on riding in the Gloves. I took some extra time with his feet though - rasping off all of the flare and rounding his hooves (years of snubbing the toes so he wouldn't stumble made his feet almost boxy) and cutting out the extra frog growth at the heel cleft. This made the Gloves fit better, and I think removing the pressure from the sulcus by carving a deeper groove in the frog made him more comfortable too. He still has a deep cleft between his heels that tends to stay a bit thrushy. The result was a perfect ride in the Gloves! he was 100% even and steady and felt comfortable all day. At the start and at every hold I doused the inside of the boots at the heel with baby powder, and powdered his fetlocks (he smelled so good :) and I think that may have helped keep his heels dry and free from rubbing. After 60 miles (pretty fast too) he didn't have any issues, I probably could have done another couple loops in them. I have no idea where the 4k came from, but I obviously don't pay a lot of attention to accumulated mileage and stuff. 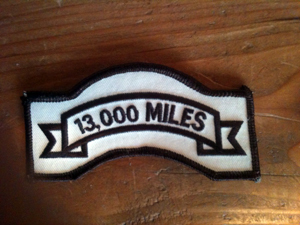 And I was pretty surprised to get a 13,000 mileage patch in the mail last week. Wow - I vaguely remember the 12k patch. Congrats on the 13K patch. I must admit that my mind still can't process that many numbers on a patch. LOL. I'm working on my first 1K patch, and I must admit once I get it, it will be a little bittersweet - all those pleasant little patches I've been getting every 250 miles go away and there's going to be LONG spells between patches. Years even. *sigh*. Oh well. way,i want to share a best free date recovery to you!